Here we are again… and by “we” I mean “me,” waxing not-so-poetic about some of the samples that I receive that cannot be imbibed (at least, not without the use of a blender and several thousand dollars in resultant medical bills). This month, I’ve got two items to recommend, though I do so with slight reservations. 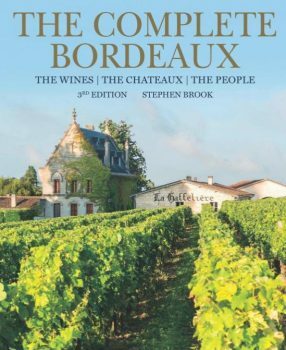 First up, there’s the recently-released 3rd Edition of The Complete Bordeaux: The Wines, The Chateaux, The People (Mitchell Beazley, $75) by the venerable Brit Stephen Brook. Brook (with whom I’ve judged in wine competitions) has thirty-five years of writing experience – and about the same number of published books – to his credit, and if one reads carefully through The Complete Bordeaux, one will be able to tell that he is a master of the English language. At first, his writing style might seem downright reticent; it’s certainly restrained. But as the paragraphs unfold in pages of the detailed profiles of pretty much anything that is of vinous significance in Bordeaux, you come away with the sense that Brook has mastered his subject, and is presenting it in the most concisely efficient prose possible. It helps that he has coverage of the topic that is both wide and deep; Brook has tasted back vintages of just about every Bordeaux house that has ever mattered. For my latest entry over at MyNameIsBarbera.com, we return to some video action for the Barbera: In the Glass section. In this short episode, I get schooled by Vinchio and Vaglio‘s Tessa Donadieu on why the wine that forms the base of the Monferrato Barbera quality pyramid – the Piemonte Barbera DOC – ought to be my go-to daily red wine. As I lay out in the introduction to the vid, Tessa has a (very) good case; not just for me, but probably for you, too, if you dig zesty Italian reds. 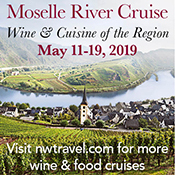 You can check out the vid in the embed below, and see more in the Your Daily Wine (Piemonte Barbera) article over at the MYiB site.